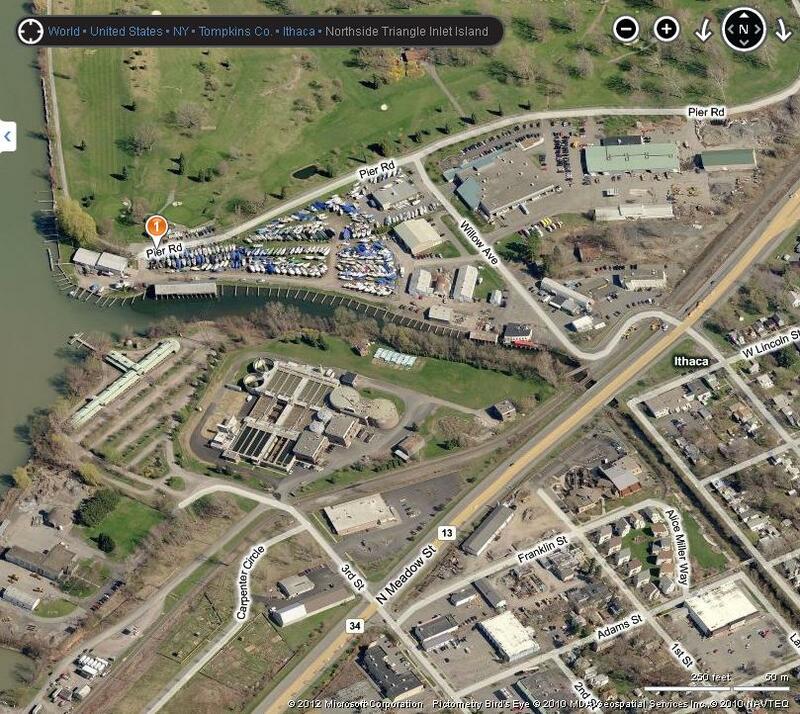 In today’s “Holy crap WTF” factor, the full scale of the Johnson Boatyard project has been released. I expected to hear about the 20 or so townhomes expected, and that was about it. But the project is, uh, quite big by Ithaca standards. This starts by going back to last year, when Ithaca modified its waterfront zoning to accommodate larger, denser projects (this was not without contention). It appears that Jeff Cleveland, the owner and potential developer, plans to take advantage of that in a big way. 11 three-story attached townhouse units with a gross square footage of 62,500 sq ft.
5 5-story mixed-use structures. These will contain 130-150 residential units occupying an area of 215,000 sq ft, and another 15,000 sq ft of retail commercial space. This includes 290 parking spaces on the side of Pier Road, with a roundabout installed at the end of Pier. A plaza, a waterfront promenade, and a pier along Cascadilla Creek. The seawall will be rebuilt and all the boat slips will be retained. Essentially, the entire 7.8 acre property will be completely redeveloped. This project would, perhaps, give Ithaca the developed waterfront it never had (or following the opinions of some locals, never wanted). The location is a bit weird because it’s outside of the more developed areas of the city (Inlet island seemed like a more logical winner from the change in zoning). Walking across the promenade will give a lovely view of some trees…and the wastewater treatment plant right across the water. Unusual project, and surprisingly large project, but it wasn’t clear what was going to be built in what phases (my guess is that it is still the townhouses first, and some staggered development from there). Impressive proposal if but only for the scale of the project. Holy smokes. I had no idea it was going to be this big. I wonder if the powers that be are going to support such a project. I had seen the announcement, but since I did a post on the new humanities building a few months ago, I thought the news wasn’t major enough to merit its own post. My plan was to bundle it with another entry somewhere down the line.